It started as a good day in the office; I was making progress on my project and for once I didn't have a person on the train in staring at me, just because I was playing an old game on my laptop. It didn't end a good day. My error that fateful day was entirely my fault, me and my silly misplaced geeky enthusiasm. At work we have quite a few assistants on call, to keep the work and coffee flowing. One guy popped in one morning, I can't remember why but a can remember what he was wearing: a red T-shirt bearing the familiar stripes of the Atari Logo. My eyes lit up; here was a guy I could relate to! "Atari" I exclaimed, with no doubt far too much excitement. He looked confused as did a work colleague sitting next to me. "Atari" I reiterated desperately trying to save face "you're wearing an Atari Computer Logo." The silence in the room was awkward but I was only just getting started. "I didn't know you liked games, what systems do you have? Maybe we could play something sometime?" This poor fellow, with his fancy boy band hair probably would have paid for the floor to open up beneath him. "I didn’t know it’s from a game, I just thought it looked cool" he said backing out the door slowly. But as seemed to be the rule in this conversation, things were again about to get worse for me. "I didn't know people your age played games, I thought you were cooler than that". His words cut through me, I felt old and yet childish simultaneously. It was a relief he left the room when he did as I was worried that I was about to be called "old timer" or even "Grandad". My work colleague was in stitches and I realised one thing that I had always suspected; I am un-cool. It's not a huge surprise, I spend as much free time not just playing video games but also writing about them. I haven't been to a club in about 5 years and the last concert I went to was an orchestral recital of the music from the Zelda games. I have never been cool I fear, though it’s not, to be honest, something I've put too high a value on. What was the height of coolness in the nineties is now cringe worthy, and in the nineties no one was cooler than Cool Spot. He was a red circle with attitude, he wore his sunglasses inside and had a walk that was so laid back that he was almost literally laying on his back. He lounged about on the beach, clambered over Sony Walkmans and could even surf on bottles. 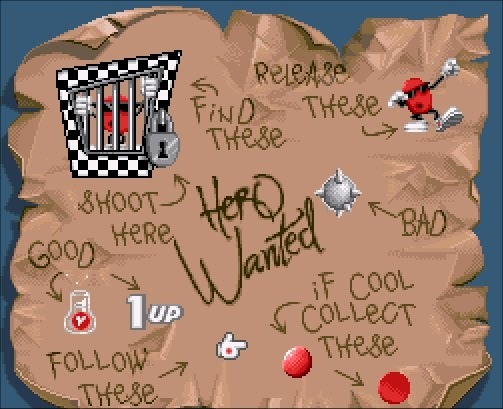 When Cool Spot wasn't inexplicably saving his other identically looking friends from cages he was leaping about from platform to platform firing streams of bubbles from his cool hands at anyone who came near. Cool Spot had a life filled with fantastic catchy achingly cool music, particularly in bonus levels. He leaped about with a tightness of control that matched Mario and he looked beautiful doing it. His worlds not only had humour and detail but also bright colourful backgrounds, Cool Spot looked so good that few could compare. The problem is though Cool Spot had a secret that wasn't well known in the UK at the time: he was a massive corporate sell-out. 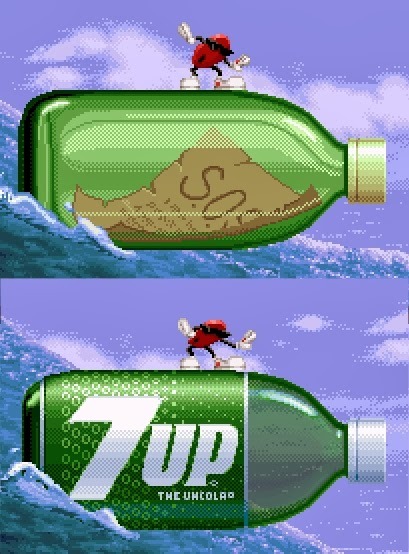 Look at the logo for the lemon and lime flavoured soft drink 7up and you’ll see a red circle, slap some sunglasses on him and you have a video game star. 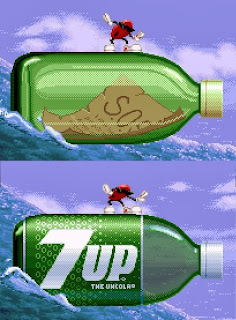 I didn't realise at the time, all traces of 7up are actually removed from the British release since we had a different mascot for the drink, a line drawing man called Fido Dido. It's only recently that I've leant that Cool Spot is actually a shameless advertising ploy. Platform games were the mainstay of the 16bit era a genre hugely prolific on the SNES. If you needed a genre that would guarantee sales jumping between platforms was your go-to. Most film licenses were platformers, with varying degrees of success. It was a genre bursting at the seams, with each new entry always compared to the finest example; Super Mario World. When compared to this masterpiece Cool Spot is a tiny game, just 8 levels long with few secrets to find. That's not to say there isn't an exploration slant to the game, as each level requires you to find a certain number of hidden red dots in a limited time. Only once this was achieved could Cool Spot then locate and free a identical but clearly less cool captured pals. It's not a game filled with simple left to right levels, as the caged Spot could be anywhere on the level. Each level feels like a maze, with a lot of the games difficulty coming from having to find the required spots. The stages may be large and complex but they are few in number. To make matters worse the final levels are actually repeats of the environments shown in the opening stages. The colour palette may have changed but even so it feels like you're actually playing the game through twice. At least it is the best stages repeated, since Cool Spot as a game actually becomes pretty irritating to play in the middle levels. A detailed large sprite needs a close up camera, meaning the amount the player sees is actually pretty restricted. This isn't a huge concern when Cool Spot is larking about on the beach, as he never has to jump further than a few character lengths. No Idea where I should be landing now.. But in environments where precision jumping between stepping stones is required Cool Spot quickly becomes a game made up of a series of leaps of faith. 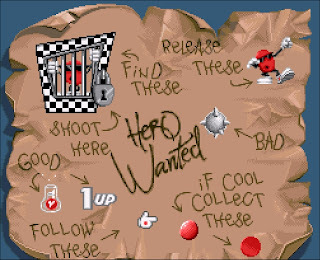 You may know where you're attempting to leap to when you press the button, but as soon as you jump that target platform vanishes from screen and you're left desperately trying to remember where it was. The penalty for misjudging this is can be instant death, making whole levels feel annoying and brutally unfair. Likewise enemies can kill you before you’ve even registered where they are. Enemy projectiles can be fired from off screen, and it’s terribly unclear which foes can pass through obstructions, and which cannot. For all its catchy music and beautiful sprites there’s no getting away from the painful fact that Cool Spot as a game is massively frustrating, and to be honest not very cool at all. All things considered, the first stages are the most enjoyable so it may well be best if you actually turn the game off after those to avoid the frustrations that come from later ones. At least this way Cool Spot may end up being an enjoyable experience rather than a horribly broken one. Time has not been kind to Cool Spot. You can look at his vivid world and appreciate it, but when a game is built around a hip and trendy central character everything becomes ironic when he has become anything but cool. 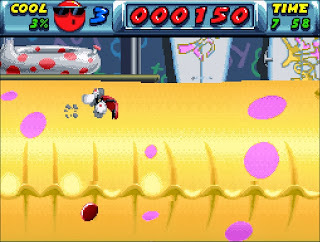 I didn't spend any time with Cool Spot or his game as a child, but as an adult I'm confident I could be having far more fun playing one of the countless other 16bit platformers. You really know you're not playing a great game when you long for it to be over and have to use a level skip code simply because you have no time for frustration in your life. Cool Spot would have been someone who impressed me as a child, but now I just want him to jump more controllably, stop making irritating noises every time he is hit and take his sunglasses off inside. If he were about today Cool Spot would be doing a tour of Universities where drunk students would be heckling him, laughing as he stumbled into pools of water repeatedly due to an inability to jump or even know they are there half the time. 7up would have long abandoned him, Fido Dido would have refused his friend request on Facebook and the highlight of his day is when someone asks for his autograph thinking he is an M&M. Poor Cool Spot, I feel his pain. I know what it's like to suddenly realise you are no longer cool and that you're now just a bit too old to try and impress the trendy teenagers. Where did I get this not so Cool Spot? Anyone planning on collecting Snes games will quickly learn the secret to buying cheap, is to buy in bulk. The ‘bundle’ search will become a favourite and every so often you’ll find one where there are more games there than you want, and more importantly few repeats of what you own. I got Cool Spot with 8 other games for £80 including P&P, which works out at about £6 per game (presuming you usually pay £3 a game for postage if bought one at a time). 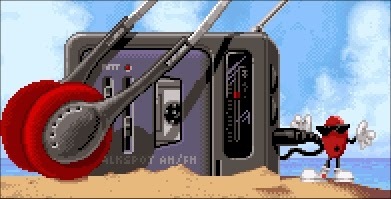 Although there were 2 games in this bundle I really didn’t want, there were some greats in there including Unirally. This game is literally mint, not any sign of damage on the box at all – with only the yellowing of cartridge giving away it’s age. I feel sorry for Cool Spot. As a platformer of its day it had great graphics and oozed '90s cool' but, as you say, the gameplay was awful! Luckily for us, Dave Perry went on to design two of the 16-bit era's greatest titles – Earthworm Jim and Aladdin. I know what you mean about these t-shirt fashionistas. Frustrating! I alwsys thought cool spot was a red apple lol. I really enjoyed this game back in the day. I haven't played this game for some years now. Maybe I will have a game on this soon.